Where Vršič Pass road descends almost to the village of Trenta, there’s a bronze monument standing at the 48th bend. An old man with a coat and a hat stares into the distance towards the mountains. Who was this exceptional man who deserved such a respectful monument in such a beautiful place? Julius Kugy (1858-1944) is known as the father of modern alpinism in the Julian Alps. He devoted most of his mountaineering career to climbing the peaks of the Julian Alps. There he discovered and marked more than 50 new routes. If you decide to make a trip the Soča valley, make sure to visit his bronze statue as it stands on a really beautiful place, where the views of the surrounding mountains are breathtaking. You can find many other natural beauties nearby. Besides, the life story of Julius Kugy is one of those that leaves a lasting impression. Julius Kugy was born in 1858 in Gorica in a family of the Slovenian roots. He started discovering the beauty of the Slovenia mountains with his father as a teenager. It was with his father, a wealthy merchant from Trieste, that he climbed Triglav for the first time. Kugy was only 17 years old at the time. Very early on he also started to show an interest in botany. In fact, his affection for the mountains arose from his deep love towards the mountain flora. To please his parents, Kugy moved to Vienna to study law, but he remained an enthusiastic amateur botanist all his life. In his student years Kugy met Muzio de Tommasini who became his botany mentor. Tommasini told Kugy about a book Plantae Alpinae Carniolicae. There, the author Balthasar Hacquet described a fine gentle flower, of silvery color and rich fragrance. Magical Scabiosa Trenta, Trenta Grintavec, was not a flower, but a princess from the 9th land. Hacquet included a drawing of the plant in his book and added a specimen in his herbarium. Then, the mysterious flower disappeared. Many botanists were later looking for it in the Trenta mountains, but no one could find it anywhere. A romantic description of the plant and its mysterious disappearance inflamed Kugy’s imagination and the young man headed straight to the valley of Soča. He was determined to solve the mystery of the lost flower so he first stopped in Bovec. He asked the district judge to provide him with a man who would lead him to the mountains and carry his backpack. That’s how Anton Tožbar became Kugy’s first mountain guide. Anton Tožbar – Špik was a perfect man for this task. Tožbar was known as a fearless hunter and had sufficient knowledge of the Trenta hunting trails. But he was even more famous by an event which marked him for life. A few years before Kugy‘s arrival in the Trenta valley, Tožbar was confronted by a bear whilst hunting. In this dreadful attack the bear bit off hunter’s lower jaw and tongue. The bear then died mortally wounded. The hunter got medical attention just in time to survive, but he then kept hiding his wound under bandages for the rest of his life. Tožbar became a local legend for his bravery and got a new nick name Death-of-a-Bear. In search of the mystical Scabiosa Trenta, Kugy began to discover the unknown world of the Julian Alps. Tožbar faithfully accompanied him to the expeditions on Mount Triglav, Mojstrovka, Jalovec, Razor, Vršac, Kanjavec and Bavški Grintavec. He showed Kugy the way and carried his backpack for what Kugy paid him fair. The quest for the fairy flower grew in discovering ever new mountain paths and new challenges. Ventures were becoming more adventurous and boundaries were moving ever further. Kugy fell in love with the Soča valley and every summer again and again returned. But soon more than 20 years older Tožbar could no longer keep up with young Kugy. In 1880, then 22 year Kugy decided to climb Mount Škrlatica. This is a high mountain, beset on all sides by steep cliffs, with the reputation of heavy and difficult mountain tour. Many great climbers were giving a great deal of effort to be the first to ascent this glorious mountain, but no one succeeded. Therefore, Mt Škrlatica was considered an impossible to climb on. They said no one could come up, except for the chamois and eagles. Those words awaken a desire in Kugy to be the first to win the top. After several unsuccessful attempts, old Tožbar recommended Kugy a new guide Matija Kravanja. Before the demanding ascent, still in the valley, young barefoot boy approached them. He asked Kugy to take him to Škrlatica too, because no one climbed as good as he did. Kugy argued that one guide was enough, but the boy insisted to go with them without payment. Young Andrej Komac – Mota joined this story of daring mountain climbers. Kugy soon realized that the boy from Trenta was telling the truth. Without Andrej, this ascent would not end well. In his later years, Kugy believed that Andrej was sent to him by the mountains. In the years to follow Andrej paved the way to a number of inaccessible peaks of the Julian Alps. Together they also discover the northern approach to Jalovec. Another mountain, which is still considered one of the most beautiful, but extremely difficult. There’s no easy way on Jalovec. All are long and tough. After the first northern approach to Mt Jalovec, Kugy again moved his boundaries of boldness. This time, Mt Jalovec became the venue of true winter adventure. The mighty mountain won a special place in Kugy’s heart. As it still keeps a special place in the royal family of the Slovenian Alps: If Triglav is a king, Škrlatica is a queen, Jalovec a throne prince and Mangart a prime minister. 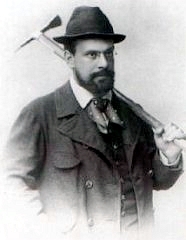 During Christmas 1884, Kugy decided for winter ascent on Mt Jalovec. This time Andrej’s brother Jože Komac – Pavr was guiding Kugy and a few of his friends. They successfully conquered the mountain fortress which was known to defend itself by falling stones. But the way back from the mountain almost ended tragically. As the group of climbers, tied to a rope, passed a dangerous slope, one of Kugy’s friends slipped into the abyss. The rope almost pulled Kugy with him. Pavr with his clear mind, colossal strength and amazing skills pulled the rope and saved both lives. Group happily returned to the valley. Kugy continued his life, torn between a job in his father’s company in Trieste and mountaineering feats in the Julian Alps. He never married. So, he had enough money and time to discover ever new trails and always conquering new peaks. He also never gave up the search of mysterious Scabiosa Trenta, which still remained a mystery. Later he sadly wrote in one of his books: They have given me all of their rare flowers, these mountains… Only the one I’ve been looking for, no. Then one day Austrian botanist Anton Kerner appeared in this mysterious story. He took a different approach and instead of searching for mythical Scabiosa Trenta high in the Alps, he headed to Ljubljana. On a dusty shelves of Carniolan Provincial Archive he found Hacquet’s old Herbarium. In it still lied a specimen of the plant. Kerner then identified a flower and it turned out that the lost princess was far from being special. Scabiosa Trenta was just a common flower that grew everywhere. But not in the Alps. Her home were sunny rocks of Karst. There the flower was known as the White Tuft. Soon the beloved Julian Alps became a stage of the bloody battles. Due to the political and diplomatic conflicts Europe sank into a dark war. These remote corners couldn’t stay hidden for long. In the summer of 1914 Kugy was just returning from one of his climbs with his friends. The news of mobilization reached them in Italian village of Cave del Predil. First World War strongly marked Kugy’s life. At its outbreak he was 56 years old and had to wear thick glasses as he was losing his sight. But when Italy declared war on Austria he volunteered into the Austro-Hungarian army. He refused to bear arms, but served as an advisor on mountain issues on the Isonzo Front. He assisted at building new mountain routes so that Austrian alpine troops could supply their soldiers with equipment, food and medicine. Thanks to him alpine troops also successfully fought the danger of avalanches. In the first winter of the war far more soldiers were killed by avalanches than enemy’s bullets. In the village of Soča, Kugy set up a climbing school for soldiers. In the dump caverns and wooden huts Kugy started writing his first book The life of a Mountaineer. Writing took him away from cannon thundering. So in the darkest period of his life Kugy escaped back to the times of his mountain adventures. The war left Kugy mentally and physically exhausted. He was also deeply hurt by the fact that the Austro-Hungarian monarchy no longer existed. Trieste, his hometown that was a part of Austro-Hungarian monarchy for more than 500 years, now belonged to Italy, the country against which he fought. He wrote a chapter in his book about his years on the front, but when the book was finally published this chapter was excluded. Upon his request the chapter was only to be published 30 years after his death. Nevertheless, his book The life of the Mountaineer got international recognition and therefore Kugy later wrote six more books. After the war he still loved returning to the Trenta valley, but he never climbed again. He dedicated his last years to writing books where he praised the mountains and portrayed his adventures with the mountain guides from Trenta. With his books he placed a lasting monument to the rough locals and outstanding beauty of the mountain nature. When his friend Albert Bois de Chasne asked him for help with setting an Alpine botanical garden Alpina Juliana in the village of Trenta, Kugy didn’t hesitate. Bois de Chasne, Swiss botanist, had a lifelong wish to arrange a fairy tale garden with a collection of a variety of alpine flowers. Including Triglav Flower from the legend of Zlatorog and Scabiosa Trenta the symbol of Kugy’s youth quest. In 1926 de Chasne began with this project. The magical garden grew in the kingdom of Zlatorog where you can still admire the colourful flowers of Julian Alps today. You can find both flowers there. The Triglav Flower blooms in July and August and Scabiosa Trenta blooms in September and October. In his later years Kugy no longer conquered new mountain peaks, but his life was still turbulent. Due to his service in the Austro-Hungarian army, Italians arrested and imprisoned him in the Coroneo prison in Trieste. Kugy ended up in a cell with other politically suspicious men. During the Second World War he took advantage of his connections and saved many Slovenian mountain guides from Dachau camp. Again, he was arrested in Trenta, but this time by the Nazis. At the time he was more that 80 years old. In 1944 Kugy fell from his bed and broke his hip. Chained to his bed he remained in the care of his housekeeper Pepina Malalan. Then, Kugy was diagnosed with pneumonia and he died from the disease. Kugy always thought of himself as an Austrian and wrote all of his books in German. But, in the minds of Slovenians he will always remain as our discoverer of the Alps. Therefore, the Mountaineering Association of Slovenia at its 60th anniversary placed this monument to Kugy. Dressed up in bronze Kugy sits surrounded by his favourite mountains. And if you follow his eyes you will see he’s looking at one particular mountain. The majestic mount Jalovec. One of his favourite mountains where he almost lost his life.